Left populism is the answer to Trumpism. 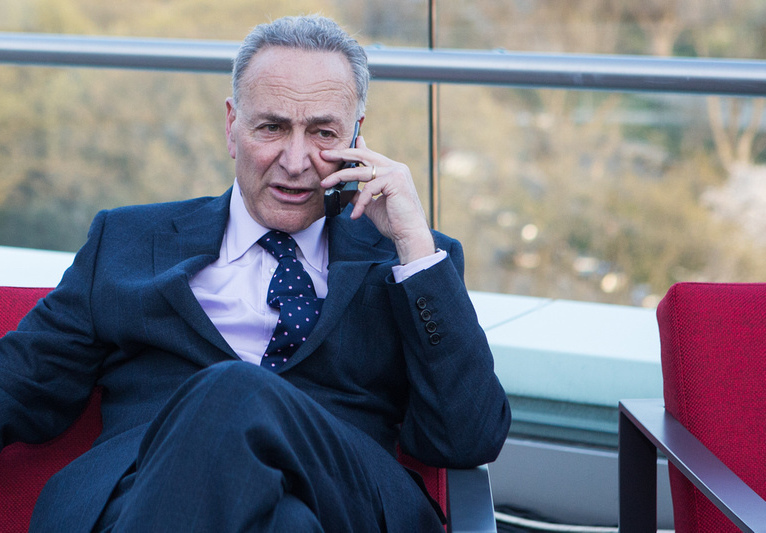 But all incoming Senate minority leader Chuck Schumer has is more favors for Wall Street. Nearly two years ago, Chuck Schumer stood at the podium of the National Press Club and delivered a prescient speech. Speaking in the wake of the Democrats’ midterm election drubbing, Schumer warned of an impending political crisis that would introduce a new level of acrimony into the body politic if “middle-class decline” continued apace. Two years later, as Donald Trump prepares to enter the Oval Office, the new Senate minority leader is well-positioned to take the Democrats in a more populist direction. The only trouble is, Schumer is a living, breathing personification of the very problems he diagnosed. Schumer was first elected to the New York State Assembly in 1974, a twenty-three year-old fresh out of Harvard Law School. He quickly staked out a position as one of the more liberal Democrats in the chamber, and occupied the same ground through the 1980s in the US House. It was upon entering the Senate that Schumer truly came into his own, making a name for himself doing what, more than anything else, has defined his political career: raising millions of dollars from industries whose interests he ardently defends. An “animal” who “would so assiduously plow through his assigned fundraising call sheets that he once ran out of prospects” and started calling numbers from the phone book at random. Schumer’s persistence has paid off. For decades, he has led the pack in corporate contributions. Between his ascension to the Senate in 1999 and his reelection in 2004, he raised $27.5 million. By 2005, he was among the top of the fundraising heap for various industries, including accounting, real estate, and commercial banks, and was the number one recipient of tobacco money. By 2008, he had received more money from the securities and investment industry than any congressman other than John Kerry. In 2009, he received 15 percent of all Wall Street donations, raising close to double that of any other senator, and five times more than any GOP senator that year. It’s true that Schumer doesn’t follow the Wall Street line in every single case. He voted for the 2010 Dodd-Frank bill, for instance. But throughout his career, Schumer has consistently interceded on behalf of business interests, particularly those that have filled his campaign coffers. In 2001, together with Bill Clinton’s deregulation-happy treasury secretary, Robert Rubin, and a host of other business, labor, and academic experts, Schumer formed the “Group of 35,” which used zoning laws and tax breaks to clear the way for office space and high-rise development in New York City. Three years later, he slipped a tax break into an unrelated bill that helped advance the construction of a mega-mall in Syracuse — a project developed by a donor who had given to Schumer and both parties. Schumer isn’t just a prolific fundraiser for his own campaigns. After seeing him action, the Democrats put Schumer in charge of the Democratic Senatorial Campaign Committee (DSCC) in the mid-aughts. Under Schumer, the DSCC ended up accumulating nearly twice as much money as its GOP equivalent. Between 2004 and 2008, the DSCC raised a record $240 million, increasing its Wall Street donations by half. As head of the DSCC, Schumer also spent his time pushing the Democrats even further to the center. He pressed the party to avoid calling for tax increases, and instead focus on “tax enforcement” and auditing more millionaires. “That shows the pragmatism of the Democratic Party,” Schumer argued. When it comes to Chuck Schumer, there’s no shortage of red flags: his close relationship with Silicon Valley; his support for the Defense of Marriage Act; his vote for the Iraq War; his opposition to the Iran deal. But it’s Schumer’s close ties to, and untiring work for, the financial industry that in the current moment — when popular anger at a venal political establishment has helped propel a right-wing populist to the White House — is the most insidious. Two months out from Trump’s inauguration, perhaps the Democrats will finally embrace a vigorous left populism, heeding the advice of people like Bernie Sanders and Minnesota representative Keith Ellison. One thing’s for sure, though: Chuck Schumer is the wrong person to lead that charge.